Pampanga is known to be the culinary capital of the Philippines. Kapampangans pride themselves to be excellent cooks and chefs. Some of the Pampanga’s noteworthy culinary gurus are Chef Claude Tayag, Chef Gene Gonzales... and the “guardian of Kapampangan Reseta” – Atching Lillian Borromeo. Atching Lillian wanted to follow the footsteps of his father and take up medicine. But her family asked her to take BS Economics instead. 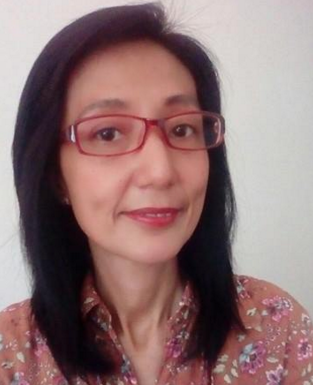 She graduated from the Philippine Women’s University. 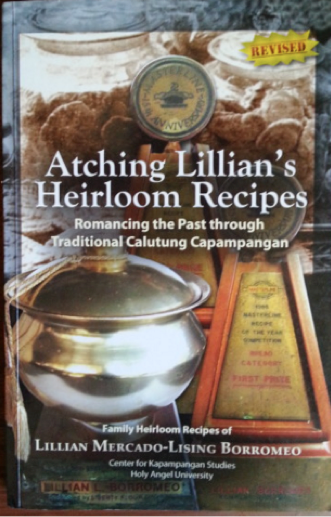 The decision turned out to be a big blessing for the Kapampangans, Through Atching Lillian, we have heirloom recipes that are kept alive, not only for the people of Pampanga, but the entire Philippines. It is well documented in the book, “Atching Lillian’s Heirloom Recipes”. In the book, she shared, “I am very fortunate to have been born into a family that has high regard for culture and a hereditary passion for cooking. For us, preparing food is both tradition and art. 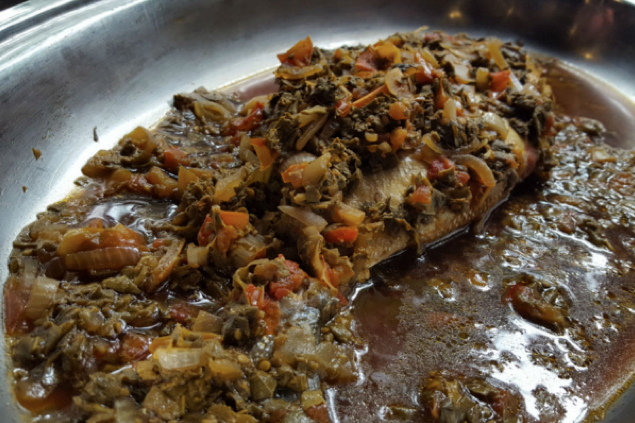 Our family’s kitchen secrets, skills and utensils are passed on from generation to generation serving as priceless heirlooms, to ensure that every dish prepared maintains its authentic Kapampangan taste”. 1. TIDTAD. Popularly known as Dinuguan, but Atching Lillian’s version reminds me of Malabon’s version known as Tinumis. What makes it interesting is its sour taste. It is also not as black as the Dinuguan, and has chunks of pig’s blood and pork innards. Expect this to be runny and thin, and not thick as your typical Dinuguan. 3. SISIG ANTIGUO. No visit of Pampanga will ever be complete without the popular sisig. Atching Lillian’s version is tasty and crispy. 4. MORCON. Morcon in Malabon is always served during fiesta and Christmas Noche Buena. So I grew up thinking that this is a celebration dish. Atching Lillian’s morcon is a mixture of ground pork, toasted garlic, onions, egg yolk, tomatoes, chorizo de Bilbao, cheese, red and green bell pepper, cornstarch, pepper, and bay leaf. 5. POCHERO. Atching Lillian's version of this dish is made of chicken sauteed in garlic, onions, and tomatoes. She whispered to me the ideal “side dish” of this pochero, which I am very familiar because it is also the “side dish” of our Nilaga in Malabon. You grill some eggplants. When soft, you mash it and mix with vinegar, patis and crushed garlic. Awesome combination! 6. BURO WITH MUSTASA. Eating Buro is an acquired taste. It is fermented rice with shrimp or fish. Best dip for mustasa. 7. OKOY. This pampanga delicacy can be cooked using squash, papaya or togue, with shrimps. 8. BOBOTONG ASAN. It is made of boneless bangus (milk fish) stuffed with a mixture of kamias, tomatoes, alagao leaves, onions, oil and soy sauce. Historically this dish is served during election time. When people say, “asan ang mga lalaki na boboto? Mga babae di boboto. Mga babae dun sa kusina. Anong ilalagay sa iluluto? Kamias. Asan?” These words repeated over time. Thus the name Bobotong Asan. 9. ENSALADANG PAKO WITH ITLOG NG BAYAWAK. This exotic salad is made of edible ferns, tomatoes, and onions topped with processed eggs of monitor lizard. 10. TIBOK TIBOK. It is a Kapampangan pudding made of carabao’s milk, glutinous rice powder, and cornstarch. It is the carabao’s milk that gives the pudding that distinct slightly salty taste which wouldn’t be achieved with regular milk. When made, the ingredients of Tibok Tibok are heated and stirred continuously until the mixture becomes smooth and thick. Once it is ready, it is poured into a baking pan lined with banana leaves where it is left to cool until it solidifies. It is then topped with latik. According to Atching Lillian, one knows that the Tibok Tibok is ready when the mixture of the carabao’s milk, rice powder and cornstartch begins to slowly bubble and pop at a pace similar to that of a heartbeat. The word “tibok”, means “pulse” in English, and when we say “tibok ng puso” it refers to a heartbeat. Hence the name, Tibok Tibok. We really enjoyed all the dishes prepared by Atching Lillian. But the star of our Pampanga food trip – the demo of how the famous San Nicolas cookies. San Nicolas is the patron saint of bakers. “San Nicolas cookies is one of the oldest cookies in the Philippines brought by the Augustinians. It’s said that miracles were attributed to them. There was this one story when the explorer Magellan crushed the saniculas with his bare hands and threw the pieces from his ship to calm the rough seas. And it did. Thus, making the landing in Limasawa (where the first Mass was said to be heard) possible.” said the Atching Lillian. My son was very lucky to experience how San Nicolas cookies are made. And Atching Lillian even gave him a signed wooden “sandok” as souvenir. 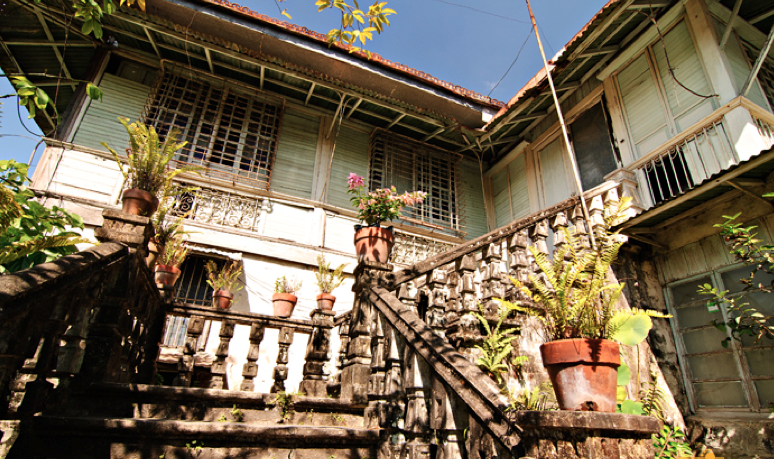 Get to know authentic Kapampangan culinary heritage at its finest at Cusinang Matua (Old Kitchen) of Atching Lillian. If you plan to experience dining at Atching Lillian’s, we suggest making your reservations weeks or even months ahead as many tourists and locals are lined-up to pay her a visit. They accept breakfast, lunch, or dinner buffets to groups with a minimum of 10 persons. For more information contact them at Tel. Nos. (045) 966-0211 or Mobile 0915-773-0788.